Numerous blog posts waiting to be written but so little time! I finally made myself take some photos and get something together. Why? Because I absolutely had to. Last Saturday I had a lovely group of friends over for a whole foods class. We discussed bone stocks and broths and what to have in a well stocked (quality, not quantity) pantry. I enjoy teaching more than I enjoyed the baking business and I hope to have more of these classes for friends in the coming year. Because they were only with me about two hours they didn't get to see the finished stock or how it was strained and used in a pot roast. While I hope to blog about various topics (mostly food related of course) a lot of my posts will be a follow up to that month's class. So if you follow this blog I hope you too learn something new and enjoy! Here is the recipe for the bone stock I made at the Bone Broth class. Remember, if you add seasoning it becomes a broth. If you plan to store the stock for later use it's best to leave as a stock and season later when you plan to use it. Preheat the oven to 400 degrees. Place the marrow bones on a rimmed baking sheet (if they are frozen there is no need to thaw them first, just place on the tray frozen). Roast the bones for at least one hour. After roasting remove the bones and transfer to a large crock pot. 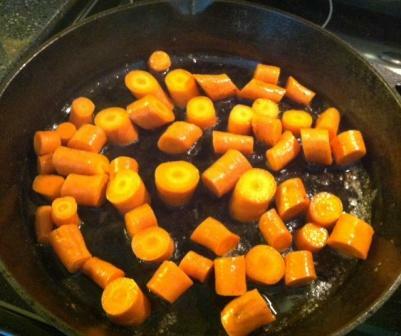 Top with carrots, onion, celery and Braggs Apple Cider Vinegar. Add spring or distilled water to cover it. Cover with the lid and cook on low for 48 hours. Remove the large pieces of veggies and bone with a spider or slotted spoon. Discard these pieces. You can eat the veggies but they really won't taste very good. 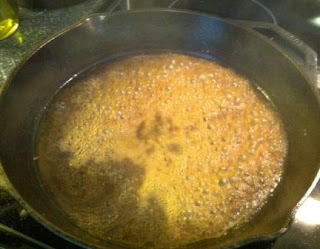 Place a large mesh colander over a large bowl and strain the liquid into the bowl. From here you can let it cool about 20 minutes at room temp or place right into the icebox. If you prefer, once it's cooled you can skim the fat off the top. I leave it in mine. After it's cooled down you can freeze it in ice cube trays or containers. Stock can be stored in the icebox about a week and frozen for up to six months. Now is a good time to prep stock and have it ready to go for flu and cold season. It's great to drink year round, daily or several times per week, if you can. This stock can be warmed and seasoned and drank out of a mug for preventative health. Chicken stock is one of the best bone broths for actual illness (good for preventative as well, but once sick it's the best). Another file will contain directions in making chicken stock. 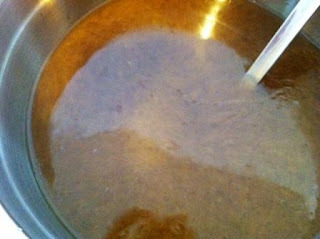 Here is a photo of the broth when finished. I used a spider to remove the large pieces of bones and vegetables. 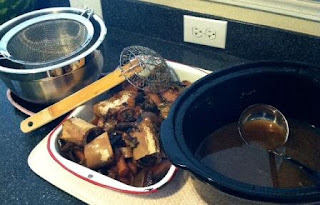 The ladle was used to transfer the stock from the crock pot to the bowl. After straining the broth I kept some for the pot roast (recipe to follow) and saved the rest in three pint and a half mason jars. These are freezer proof so once chilled they will be frozen for up to six months (but it won't last that long in our house). Here is a step by step guide in making a pot roast. We are fortunate to have several resources for excellent grass fed beef where we live and when buying beef of this quality you can easily use the less desirable cuts. While we prefer chuck roasts this arm roast worked out great slow cooked for six hours on low. First if the meat is frozen thaw it in the icebox overnight. You can most certainly start with frozen meat but I find it cooks more evenly when thawed first. 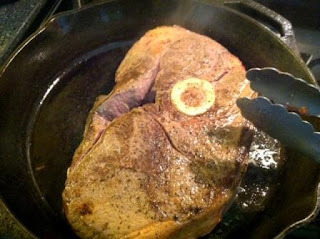 Season the meat well with kosher salt (it sticks better) and black pepper. While the meat rests on the counter I prep the veggies. Today my dd cut the carrots while I took care of the onion, garlic and leeks. 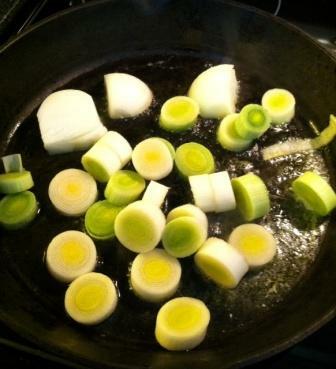 I wouldn't typically use leeks with a pot roast but I was down to one onion and had two pounds of leeks on hand. There is no specific quantity of veggies required. Just use what you have on hand and what you like. That includes the herbs, just use what you prefer! Some people add potatoes but I roasted five pounds over the weekend so we had a few ready to go and not needed to cook with the roast. But if you want you can add them as well. Once everything is prepped heat some butter and olive oil in a pan (you can substitute expeller pressed coconut oil here as well, but I prefer this combo for this type of dish). This butter is also from a local farmer, grass fed just has this beautiful color and taste! We just love it. Once the skillet is hot, saute the onions for a few minutes and transfer to a crock pot. Do the same thing with the carrots. 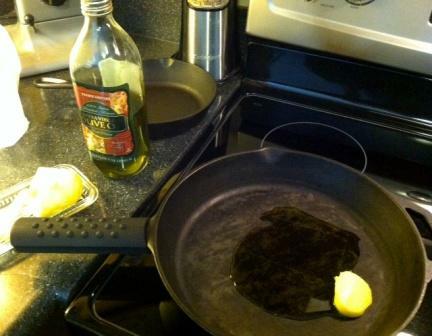 Now, take the seasoned meat and brown it on both sides (about 2 minutes each side) in the same skillet. Transfer it to the crock pot on top of the veggies. Now take a large ladle full of bone stock and put it into the hot pan to deglaze it. 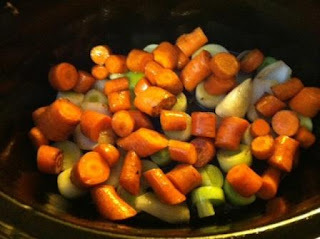 Pour the juice over the meat and veggies in the crock pot. Add about two ladles full of stock over the meat and veggies (about two cups). This will help keep the meat moist during cooking and add more flavor. Season with a little more salt and black pepper. 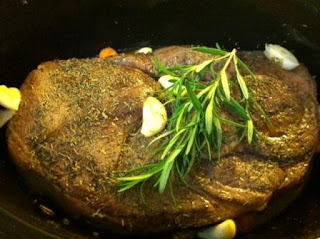 I also added dried thyme, six cloves of garlic and a sprig of fresh rosemary on top. Cover with the lid and cook on low six hours or until tender and it falls apart (this was a four pound roast). Another family favorite recipe in using beef stock is Julie Child's French Onion Soup recipe. It is truly the best! Here are some photos from the last time we made it. Bon Appetite!